Since you are officiated as coordinator for IIRS Outreach Programme, please provide your complete details like: Name, Designation, Email ID and Address. The course is open for all the Student of undergraduate course/ Postgraduate course (any year). Faculty / Researchers at university / institutions are also eligible to participate in this course. During online application form you have to select the course which you wish to apply. We have list of universities/institutions/colleges networked under IIRS Outreach Programme. Select your university, if your university is not listed please refer Procedure to join IIRS Outreach network. After approval from IIRS /ISRO you can register. Please provide your personal details like Name, Designation, Date of Birth, Gender, Nationality, E-Mail etc. University/Institute/Organisation shall support its own Outreach classroom facility for the planned training. University/Institute/Organisation shall meet the financial requirements on its own for the expenditure incurred on the training at their place. Identified focal point at the University/Institute/Organisation shall coordinate the day to-day activity requirements of the planned training program. University/Institute/Organisation will be responsible for arranging the Outreach classroom for the scheduled training program, registering students for the training, taking attendance of the students and taking care of all needs, as and when required. University/Institute/Organisation is responsible for conducting the online examination for all eligible participants. Later compiling and sending the result sheet of participants. University/Institute/Organisation coordinator shall collect feedback at the end of course for improvements to me made in future courses. In this course, nominated coordinator/focal person of University/Institute/Organisation is not allowed to participate as a registered student as per the guidelines. Coordinator will be awarded with a certificate on completion of each course conducted by him/her. Coordinator will get regular updates on Remote Sensing & Geospatial Technologies. 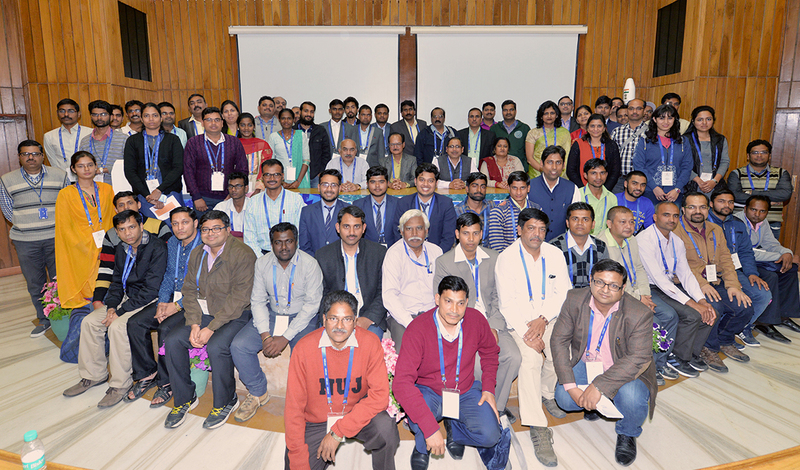 Coordinator will be invited to attend IIRS User Interactive Meet on annual basis. A-View: A-VIEW is an advanced multi-modal, multi-platform, collaborative e-learning solution which allows an instructor to teach or interact with a large number of learners transcending geographies on a real-time basis through live audio video streaming and synchronized content sharing. A-VIEW allows the instructor to perform live evaluation of the learners and to get real-time feedback from attendees on the go. A-VIEW can also act as an online meeting tool that can support online social collaboration and interactions with multiple users from various locations simultaneously. Faculty / Researchers at university / Institutions. Course study materials such as lecture slides, video recorded lectures, open source software, data & handouts of demonstrations, etc., will be made available through IIRS ftp link (ftp://ftp.iirs.gov.in).Video lectures will also be uploaded on YouTube Channel (http://www.youtube.com/user/edusat2004). There is no course fee. It’s absolutely a free of cost programme. Students: Based on 70% attendance and online examination. 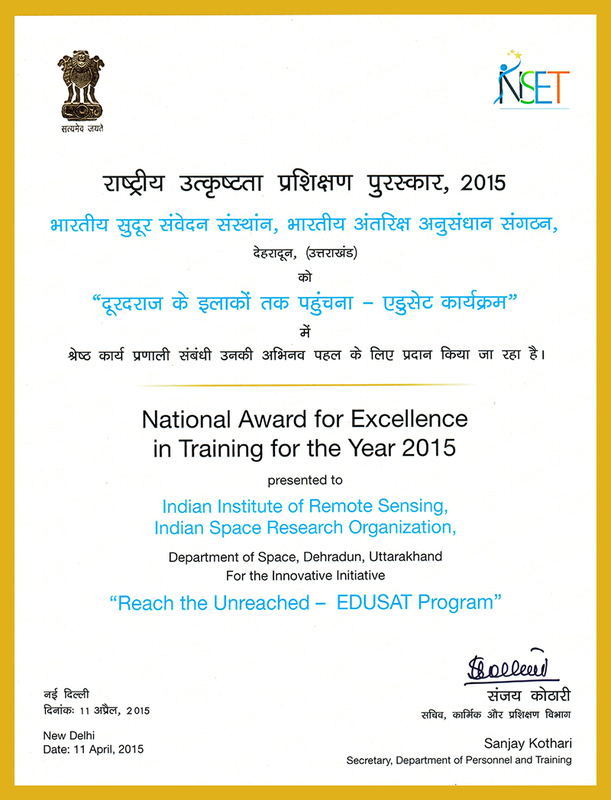 IIRS received two national awards for excellence in training for outreach and e-learning programme by Department of Personnel & Training (DoPT), Govt. of India in collaboration with United Nations Development Programme (UNDP).